When I was researching our Myrtle Beach vacation back in 2015, I had looked into us going to Pirates Voyage one night. When I proposed this idea for that trip, we decided that Michael just wasn't quite ready for it. So, last year when we went back to Myrtle Beach I brought this idea up again and we decided to give it a try. We decided that we would do this for our first night since I never plan on cooking the day we arrive to the beach. So, after we unloaded our car we headed down to the front desk and purchased our tickets for that night's showing. If you want, you can even purchase your tickets before your trip via their website. You want to arrive early. After you go through the ticket box area, you'll get your family/group picture taken which will be available to purchase at the end of the show. 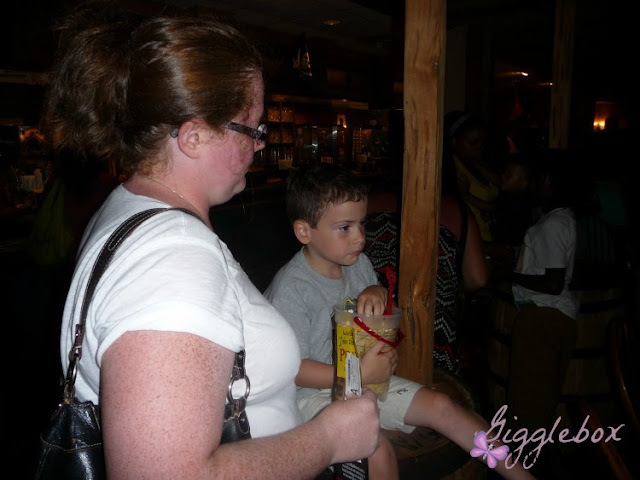 After your pictures are taken, you can go into the gift shop and do some shopping or you can head over to the Pirates Village. 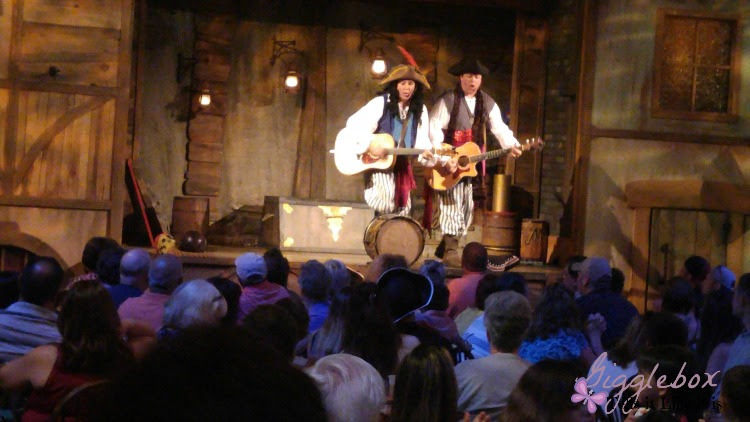 There you can sit down and enjoy a fun show from some fellow pirates. You can also get some drinks and some light snacks while you wait. We decided to get our popcorn loving 5 year old the popcorn in the souvenir sand bucket and shovel. If your kids like to have their face painted, you can also get that package added to your ticket and will be done during this time. 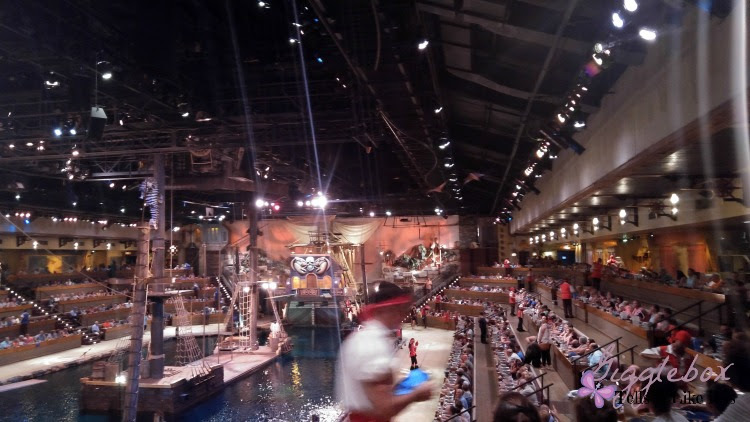 Once the pre-show has finished, you'll then go into the huge arena and find your seats. You'll be divided into two different teams, the blue and the red. We were on the red team. Your ticket includes a 3 course meal, drink, and of course a show. I absolutely loved the food and ate every bit of my meal. You'll be happy to know that you can get a to go bag for the food that you don't eat. Michael didn't eat any of his meal and I had a feeling that was going to happen so it turned out to be a very nice lunch for me the next day. Beware that you get more chicken than you do pork. 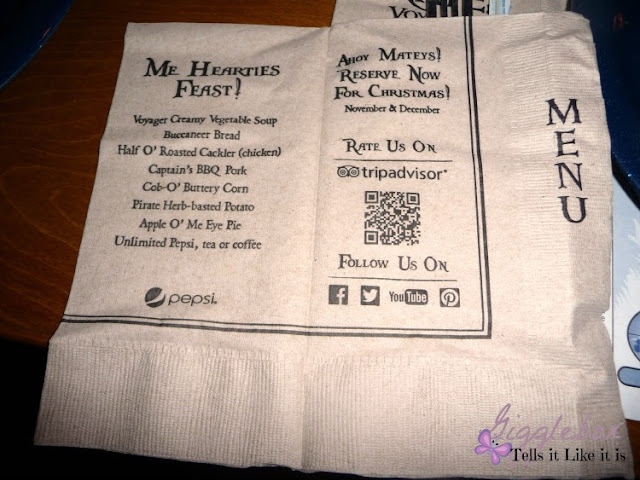 If you've never been to a dinner show like this before, the food will be brought to you while the show is going on. 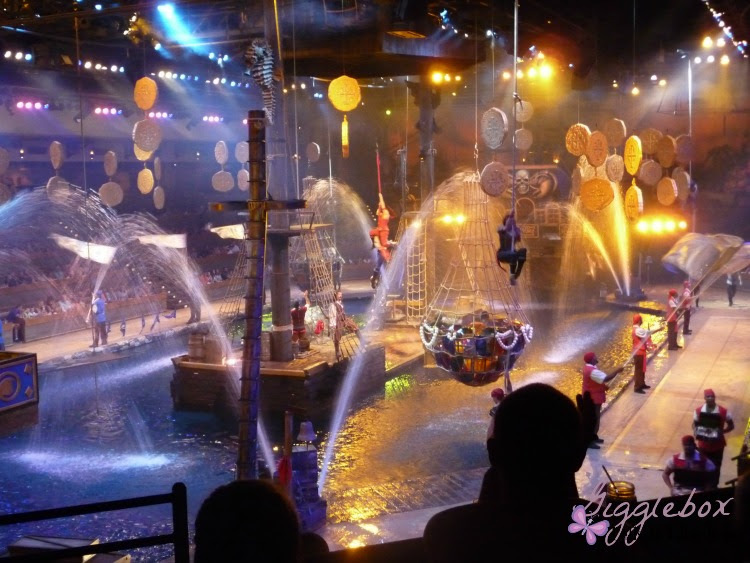 The show is amazing with all the action, acrobatics, and some live animals. There's also several times where there's audience participation. We bought Michael a red flag to wave to help cheer on our team. We had a great time watching the show and feel that everyone should experience it at least once. 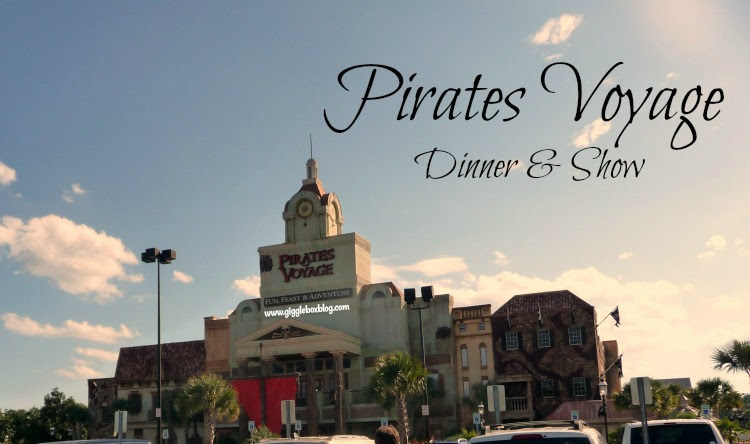 If you have a kid that loves pirates, this is a must do. I know it's a little pricey, but you get a lot of food and a great show. Have you been? What did you think of it? 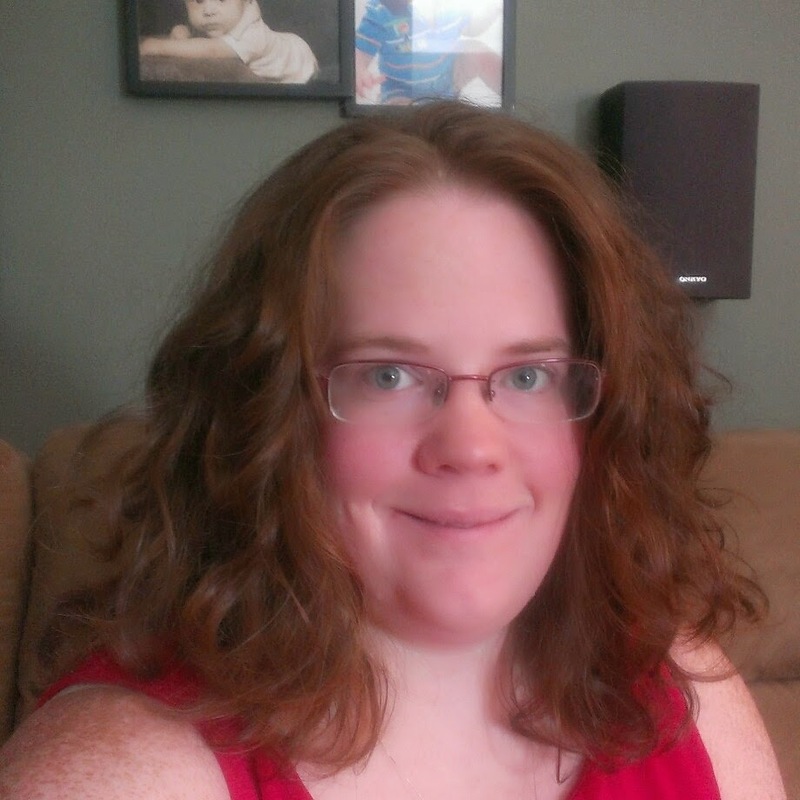 I'm a stay-at-home mom in the DC Metro area who tries to focus on family, fun, and frugality. I'm always looking for new and exciting things to do with the family. Follow me on this adventure called life! This looks like such a fun place to visit. I think my daughter and more specifically my husband (the biggest kid of all) would love this place. Especially the popcorn. I'm a stay-at-home mom in the DC Metro Area who is always looking for new and exciting things to do with the family without breaking the bank. I write about kids, meal planning, DIY, crafts, holidays, recipes, and good old family fun. Follow me on this journey called life! Your privacy is important to Gigglebox Tells it Like it is. Read our policy here on how your personal information is collected and how it is used when you use our website. Copyright © 2016 - 2018 LEM Designs.